In a game with over 200 different items and an ever-growing roster of champions, itemization is one of the more challenging aspects to learn as a beginner. At the start, knowing what League of Legends items to buy, and when to buy them is where many players fall flat. In this beginners guide by PicklePants, we will go over every Support item in the game to help you understand when you should and shouldn’t buy them. This will be the first of our LoL Items Guide series, and we will be going over tanks items, assassin items, AP mage items, and more over the next month or so. Because there are 3 main Support playstyles, we will discuss what items are viable for each of the utility, tank and mage Supports, while providing a few examples along the way. Before we move on, it’s important to discuss the terminology and provide a little background information. When you first start playing League of Legends, you won’t understand what every item does. This is natural for any game, as nobody expects you to know the ins and outs before playing. Many players copy the same build path over and over again, and never change their item order. On the other hand, some players don’t buy items, or buy items that are not going to benefit their champion such as AP items on an AD reliant champion. This is where our Mobalytics guide will come in handy. By knowing when to buy each item, you will have an advantage over the enemy who hasn’t fully grasped the concept yet. Core items are almost always brought on your champion and syngerize really well with your champ’s kit and what they want to do. As an example, Boots will nearly always be a core item and it’s an expected inclusion. Situational items are not necessarily purchased every game, apart from when you need them. More often than not, situational items will be reactive to what the enemy has. For example, if the enemy has lots of AP damage, you should buy magic resist. Essentially, every Support item will fall in one of these categories depending on the champion you’re playing. If you stumbled upon this article in search of how to build your Support champ, you’re in luck. Our free Pre Game tool gives you a build curated by our high-ELO experts right before your match begins. If you’d like to try the Pre Game, just click here to sign up for an account! It’s quick and easy, and there are a ton of other useful tools within the Pre Game feature itself and the rest of our platform. Now, on to the rest of our adventure through Support items. From left to right: Ancient Coin, Relic Shield, and Spellthief’s Edge. There are only 3 starting options for the Support, and each is designed to be taken by specific champion archetypes that can benefit from it. Each of the items provides gold income and allow you to eventually gain wards via completing a quest. The first starting item for Supports is Ancient Coin. This item is the most passive of the three choices – you generally take this if you want to play it safe. If you don’t feel comfortable getting up close and personal during laning phase OR if you’re not looking to poke often for damage in lane, Coin is likely the way you want to go. Try to always pick up the gold coin whenever possible. Like the other Support items in this guide, it has a quest related to it. Every so often (and guaranteed for cannon minions waves), there will be a coin that drops from minions. There are 2 coins that drop and they rotate in order. There is a blue and a gold coin. The blue one provides mana and the gold one provides, you’ve guessed it gold! Note: Since the coins only drop in lane, you may want another option if you’re planning on leaving lane and roaming often since you’ll miss out on guaranteed income. Alternatively, avoid roaming when a cannon minion is in lane as it’s guaranteed to drop a coin. Examples of champions who benefit from taking it: Janna, Pyke, Rakan. The second Support item is the Relic Shield. 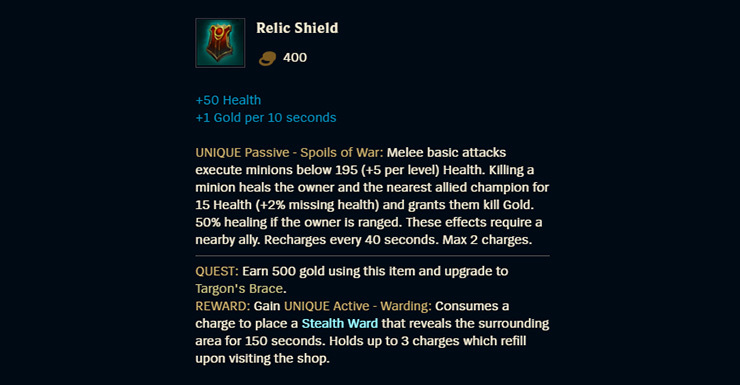 This is an item that is purchased on champions that will be building primarily tank, or who are tanky in general as it provides health, protection and a little bit of sustain. This item will also give your ally the gold, and a little bit of healing if it’s needed. The quest for this item requires the user to earn 500 gold through last hitting minions (you share gold with your laner). You will find that there are orbs that float around your champion to tell you how many minions or stacks you can take. You can also check how many you have available to you by looking just above your ability bar. If you have available stacks, you should auto attack and last hit the minion. The priority goes as follows: cannon minion, melee minion then ranged Minion. I would prioritize the first two and never last hit a ranged minion with this item as it gives little to no gold for your quest. Examples of champions who benefit: Pyke, Alistar, Nautilus. The final Support item is by far the most impactful of the three, but also the most challenging to stack. 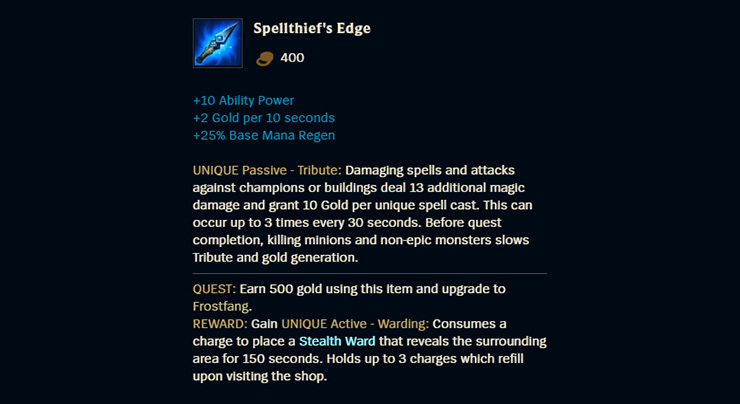 This item is Spellthief’s Edge. It is taken on champions that can deal damage, or when you’re in a good matchup. It provides mana, gold, and early AP which is crucial to dominating the lane. If you’re in a matchup you can play aggressively and poke, Spellthief is your item. It is the most challenging and difficult Support item to stack because it relies on the user being proactive with it to get the most gold. For example, making sure to consume all of it stacks whenever possible and minimizing the downtime between gaining stacks. This item relies on you hitting the enemy with your basic attacks and abilities while avoiding taking your allies CS (which forces the item on a brief cooldown). You can have a maximum of 3 stacks which can be consumed by dealing damage through auto attacks, abilities or hitting a tower. Make sure to consume them as often as possible. Examples of champions who benefit: Janna, Zyra, Brand. You may have noticed we used Janna as an example twice when suggesting who benefits from an item. Janna is a prime example of a champion that works great with both Spellthief’s Edge and Ancient Coin. This is just one example of a champion who can take more than one starting item. Since you’re limited to one, you will need to pick the item that is going to help you the most during the laning phase. For example, if you’re in a good matchup and able to trade frequently, take Spellthief’s Edge. If you’re in a poor matchup where you’re unable to hit the enemy, take Ancient Coin. Advanced items, also known as upgraded, or tier 2 items are items that have only been upgraded once. They consist of one or more basic items to be created, and they will be what you’re sitting on when you have no finished items. As soon as you have enough gold, 450 to be exact, you can afford to upgrade your starting item to its advanced form. We won’t go into to much detail, but for you to be able to start providing vision for your team, you will need to upgrade your starting item and complete the warding quest. For utility Supports, you’ll need 450 gold to buy Nomad’s Medallion plus 500 accumulated gold on your warding quest. For tank Supports, you’ll need the 450 gold to buy Targon’s Brace plus 500 accumulated gold for your warding quest. Finally, for mage Supports (you guessed it), you’ll need 450 gold to buy Frostfang plus 500 accumulated gold on your warding quest. From left to right: Nomad’s Medallion, Targon’s Embrace, and Frostfang. Once your quest is completed, you will be granted one ward on the spot. Returning to base will up your starting item with three wards that can be placed. Run out of wards? Return to base! It’s very difficult to talk about every advanced item that is available to the Support because there are so many variations. My advice to gain an understanding of what item you may need is by looking at the finished item’s recipe. From there, you can look at the individual items that are needed followed by the stats they provide. For example, if you’re playing as Janna, you will look to buy an Ardent Censer first. The recipe for Ardent Censer is Forbidden Idol + Aether Wisp. If you want extra damage, you would take Aether Wisp. If you need more protection, like if you’re against a damage dealer, you may favor taking Forbidden Idol with the bonus CDR and healing/shielding power. Once again, this is a prime example of adaptation and understanding of context in League of Legends. After you’ve completed your warding quest and upgraded your starting item to tier 2, make sure you go ahead and change trinkets to the Sweeping Lens so you can start denying vision around the map. Completed items are items that no longer need upgrading and have reached their final form. They cost quite a bit but are cheaper for Supports compared to any other role. Because we can’t cover every champion or playstyle, we’re going to go over some of the more popular items that a Support can take. There is a range of different Supports with different item builds, we will only go over items that are more commonly found on Supports and are not unique to each champion. For example, we won’t be talking about Pyke because he is a fringe case that can be built full AD. If you’re wanting to learn specific item builds, stay tuned because we will touch on that subject later on. Ardent Censer is a core item for the majority of utility or healing Supports because it increases your healing and shielding power. It also gives you a range of healthy stats that will allow you to deal more damage during the laning phase and in team fights. On top of that, you also have some cooldown reduction, which means you can use your abilities more frequently. This item can provide you and your team with a lot of bonus stats which include bonus attack speed and additional damage, all you need to do is give your ally a shield or heal and they’ll receive this bonus. So if you’re playing a Support than often shields or heals, this item is going to be really good on you. Examples of champions who benefit: Janna, Karma, Soraka. 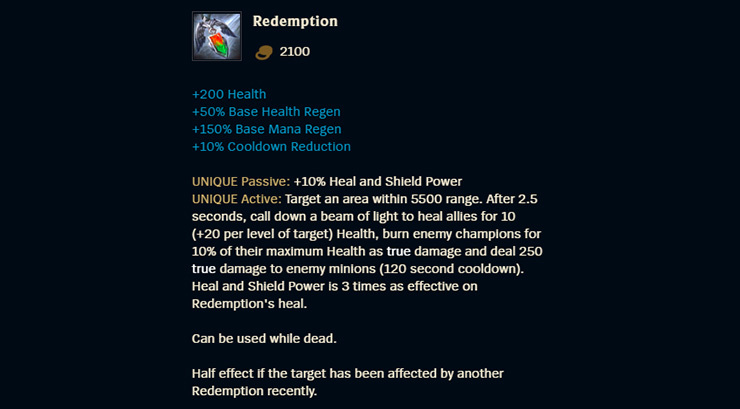 Redemption is an item that is not just limited to Utility or healing Supports. Instead, it is viable on a wide variety of champions. From tanks to healers (and even some junglers recently) many Supports can pick up this item. Basically, this item gives an AOE heal that shoots down from the stars, healing your allies and dealing some damage to the enemy. However, while it does scout vision, it doesn’t deal damage to Baron or Dragon- so no, you can’t steal an objective with it. This item is fantastic in team fights because it can give your team some healing which can come in clutch and win you the fight. If you’re being denied vision, it’s also a good way to expose an area, such as when you think the enemy team is looking to take Baron. 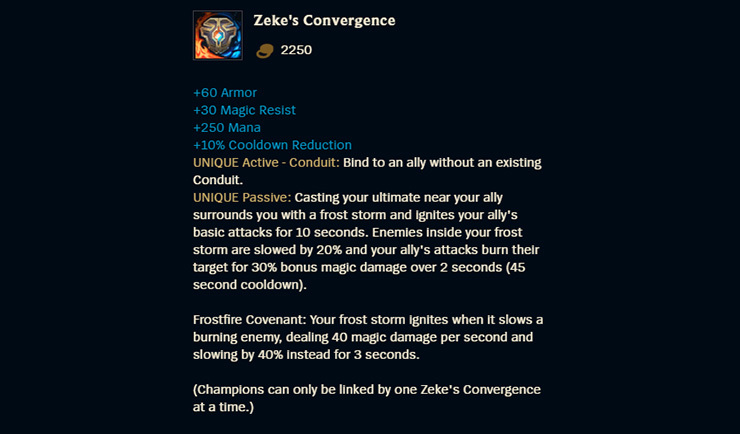 While unique passives don’t usually stack, Ardent Censer and Redemption work in conjunction with one another. Examples of champions who benefit: Nami, Rakan, Morgana. Mikael’s Crucible is an item that will help you escape from the enemy if they have hard crowd control. It’s usually purchased to cleanse stuns, roots, taunts, fears, silences and slows to a target allied champion. For example, if the enemy has point and click CC like Rammus E and locks down an ally, you can free them with this item. No, it doesn’t work against Malz Ult. This item is also pretty good on utility Supports because it increases your healing and shielding power which will definitely come in handy during team fights. Some abilities this item counters: Rammus E, Morgana Q, Zoe E (Removing the Drowsy effect prevents the target from falling Asleep), Ashe ultimate, and Twisted Fate W.
Note this item doesn’t work well against champions who are suppressed by abilities like Malzahar Ultimate, Skarner Ultimate or Warwick Ultimate. Instead, the user will need to buy QSS (Quicksilver Sash) to escape them. If you want to know everything it counters, click here for a good reference on LoL Wiki. Examples of champions who benefit: Janna, Nami, Thresh. This item will provide you and your nearby allies a shield that can protect you against incoming damage. Locket of the Iron Solari also provides the user with some defensive stats that are incredibly valuable if the enemy is heavy on the AoE damage side. Locket of the Iron Solari is great on tank Supports because it scales with health. Which means the more health one has, the bigger the shield you will give your allies. There is some controversy around this item with it being valued on utility Supports as it scales with health. To some extent, it is personal preference, however, I feel that it is pretty good on champions like Janna because it provides another shield which will always be useful for peeling in a team fight. Examples of champions who benefit: Thresh, Alistar, Gragas. 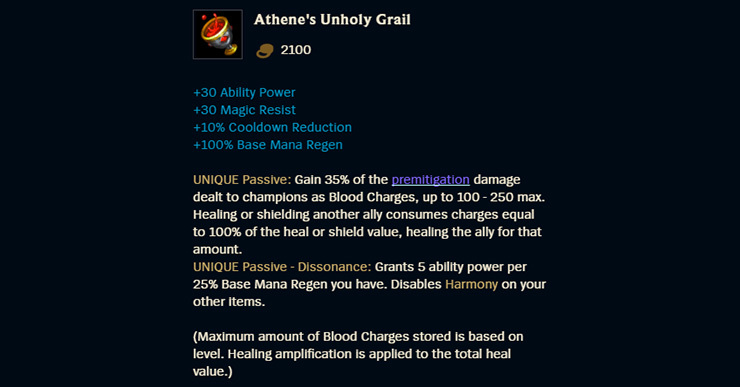 This item is really good on champions that can heal or shield allies but also deal consistent damage. Whenever you deal damage to an enemy through either basic attacks or ability use, you will gain stacks which can be consumed by applying a heal or shield to an ally. The concluding heal (or shield) would be sufficiently stronger. Usually, you would go this item first because it, in my opinion, is much stronger during the early game which is where you can get the most use from it. For example, if you’re playing Nami, you could abuse this item in the laning phase. In team fights, it’s much more difficult to use as you won’t be dealing much damage. So to some extent, the value drops as the game goes along. This is why you either buy it first, or not at all. Examples of champions who benefit: Nami, Soraka, Sona. 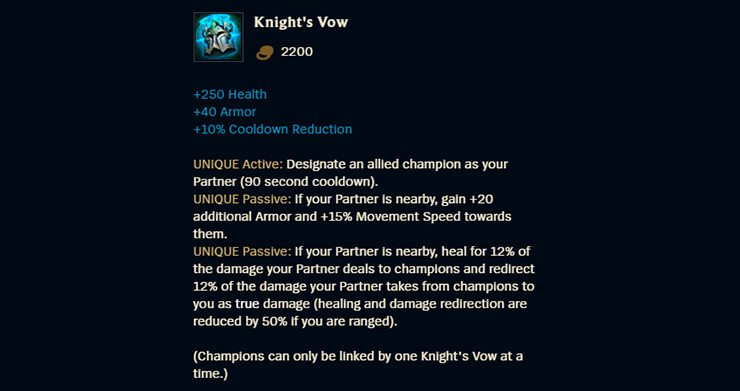 Knight’s Vow is another item that is really good on tank champions. If you’re playing somebody who builds lots of health or sustain, this item is for you. Mostly taken on Supports, it has seen some play in the Top lane and on Junglers. Make sure you bind your Knight’s Vow with an ally. This item redirects damage to you whenever your chosen ally takes damage. It also heals you a portion of the damage they deal. You should prioritize linking yourself with your ADC or a ranged champion so they can stay alive for longer. In most cases, this will be the ADC, but if you have somebody like a Twitch Jungle, it would work on them too. As the item redirects damage to you, it’s important that you are playing a champion who has a lot of defensive and health stats otherwise you will die rather quick in team fights. You should avoid this item if you’re playing a utility or squishy Support like Soraka or Lulu. Examples of champions who benefit: Alistar, Leona, Gragas. If you’re playing somebody with an ultimate that is used either in the start or during a team fight, or if it has a short cooldown, then this item might be for you. When you’re close to a bound ally, casting your ultimate around them ignites their basic attacks. Remember to bind your Zeke’s with an ally. Zeke’s will also deal damage to enemies who are nearby as it creates a frost storm around you which slows enemies who are inside of it. This will aid you at protecting your allies and keeping them safe as they will be slowed to a crawl when trying to get to the backline. It’s a smart idea to bind your Zeke’s with somebody who deals a lot of damage through basic attacks to get the full value of the item. You shouldn’t use this item on an AP champion because they do not auto attack enough to get value from it. Champions who benefit: Blitzcrank, Rakan, Leona. Twin Shadows is an item that some AP Supports like to purchase as it doesn’t cost an arm and a leg, and fits right into a Supports budget. This item gives lots of AP, some cooldown reduction and bonus movement speed which is great on AP Supports as many of them are rather immobile. Twin Shadows also has an active that sends out 2 ghosts for 6 seconds that run around and look for enemies nearby. If they come into contact with anyone, they reveal their location and slow the enemy to a crawl. This active can be useful when you’re trying to ward, trying to chase, or trying to escape as it will tell you if anyone is nearby and slow them appropriately. Champions who benefit: Zyra, Vel’koz, Brand. Every Starting item can be upgraded and completed and there are 2 variations to each of them. Remnant of the Ascended, Remnant of the Aspect, and Remnant of the Watchers are each items final upgrade but with a twist. They will only be this item if you’ve not completed your warding quest yet. From left to right: Remnant of the Ascended, Remnant of the Aspect, and Remnant of the Watchers. Once the quest is completed, they will automatically turn into Eye of Ascension, Eye of the Aspect, or Eye of the Watchers. If you’ve already completed the quest, upgrading and completing the item will provide you with some extra stats and an additional ward (for a total of four). From left to right: Eye of Ascension, Eye of the Aspect, and Eye of the Watchers. Adjust your item build whenever you need to. While our build paths or item suggests are a good basis to go by, make sure you adapt to whatever circumstance you’re playing in. For example, if the enemy has lots of AP damage- purchase Mercury Treads. Complete your starting item later on in the game. Personally, I recommend that you complete your Support item later on in the game because the value of other items are more impactful. While you should always upgrade your starting item to tier 2 (so you can start placing wards), I find it is better to get your first core item quicker rather than delaying it by completing your Support item. Make sure to purchase Control Wards. You should always purchase a Control Ward whenever you can and place it somewhere on the map. Also, make sure that you buy them consistently throughout the game. Prioritize Control Wards over items (in the late game). Unless you’re going to complete or buy a much needed advanced item, instead of purchasing and filling up your item slots, save it for Control Wards. This will make warding objectives and taking Baron much safer. Just play the game and try to find an appropriate build path yourself by seeing what works well on your champion. As we mentioned at the top of the article, in the Pre Game, you can see what we recommend to build on your champion and when. This is useful as you can just launch it automatically before every game and get a build without having to search prior to the game starting. If you want to keep track of your own builds in your match history and study the builds of any summoner, our Summoner Profile feature is your go-to tool. This is another great option because pro players are really smart and do a lot of mathematical equations and research to work out what fits best and when. Try out some of the recommended items. Each champion in the game has a dedicated list of items that Riot recommends to build. Give some of them ago and see what tickles your fancy. Thanks for reading! We hope you enjoyed this Support item guide. As always, you can find Picklepants in our Discord if you have any questions.